Intrepid Café is a coffee, tea, chocolate, and toast bar located in Kendall Square of Cambridge, Massachusetts. Our space was designed and built to provide customers an approachable, minimalist space to interact with - Espresso drinkers may lean in to watch their shot being pulled on our two group Modbar; filter coffee drinkers can talk to our baristas about origin and process while they prepare a pour-over; and tea enthusiasts can take time to sample the aroma of any leaf or herbal blend from our current selection. Interested in bean-to-bar chocolate? Try one of our three chocolate menu items - as a bar or in a hot chocolate. Commuters - we've got you covered. Take away a hot coffee or cold brew for super-fast service. All coffee in the shop is roasted and supplied by local roaster, Gracenote Coffee. This is relationship that we're proud to uphold. 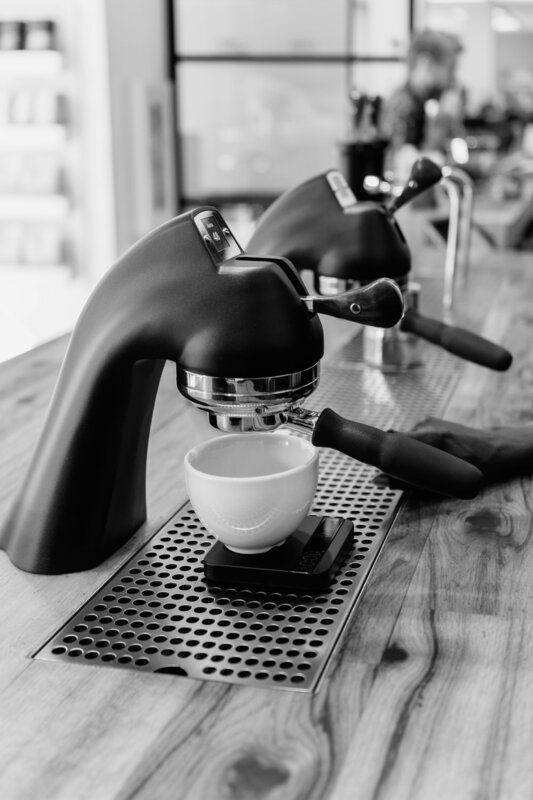 While striving to commit to every coffee they work with, Gracenote mention that they "attempt to see those coffees for what they are, and undertake the task of roasting in a manner that allows them to express what we imagine and understand to be a coffee's full potential". Such a genuinely curious approach to coffee can also be experienced at Intrepid Café. We attempt to not limit ourselves to preconceived notions or strict parameters. Instead, we strive to explore every coffee in a unique way, based on how we think it can be reflected in the cup. 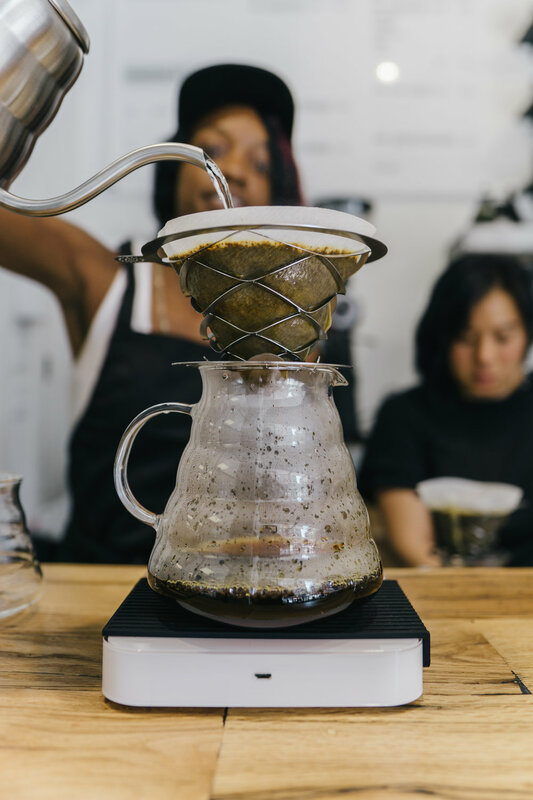 We're always tinkering across three different brewing methods - espresso, filter, and cold (brew). Balance is the key, here. We want you to enjoy every cup, from the top to the bottom. As an industry, bean-to-bar chocolate is following closely behind specialty coffee. The two share a similar language - any flavor profile can be broken down and attributed to the origin and variety of the cocoa, and the approach of the chocolate maker. Faint nuances across the production chain can produce a bar of chocolate entirely different to any other. Thankfully, this provides us another outlet to explore. In store, we offer a variety of bars from chocolate makers across the United States. Take a bar home or enjoy it with a hot cup of coffee or tea. Better still, try one of our hot chocolates - the molten version of a currently featured bar of chocolate. We're thankful to be supported by the good people at MEM Tea Imports, located in Cambridge MA. White, green, black, herbal, hot or cold - try any one of the seven teas featured on our rotating menu. What's the best? Where should you start? Start at the top, and work your way down. We give every tea the attention that it deserves. Do you have any feedback that you'd like to provide us? Any questions or concerns? We'd love to hear from you; even if you're just hoping to stop by to say "Hey!"